They’re calling it the biggest UFC match of the season and rightly so. With tickets selling out just minutes after becoming available, it is easy to see why so many people will be tuning in to see this grudge match. In one corner you have Conor McGregor. He is still reeling from his huge loss last year to Floyd Mayweather in the biggest and most lucrative boxing match the world has ever seen. He is hungry and he is looking to win back his title from the man in the other corner. That man is Russian UFC champion Khabib Nurmagomedov. Khabib stripped McGregor of his title due to the Irishman’s absence from the sport for almost two years. The Russian wrestler has proven to be a force to be reckoned with his incredible strength and skill taking him all the way to the top. So Khabib is certainly looking to keep his title, but the trash-talking Irishman is on the warpath so it’s anyone’s guess. The only thing we are confident in, is that this UFC match is going to be out of this world. 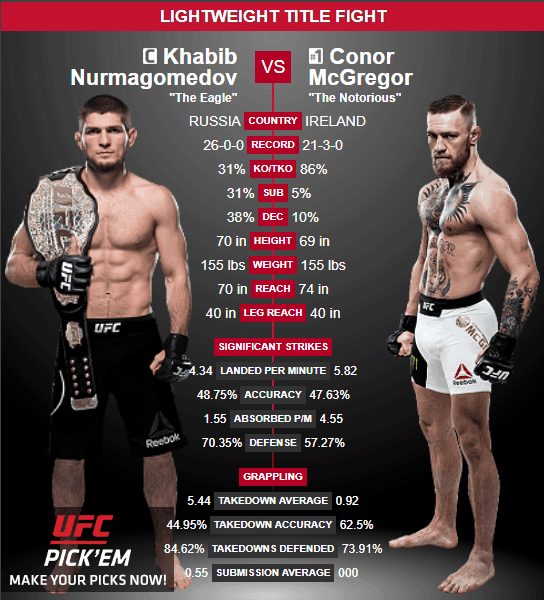 Want to watch McGregor vs Khabib online? Keep reading and soon enough you will be well on your way to hosting the biggest UFC party at your house. 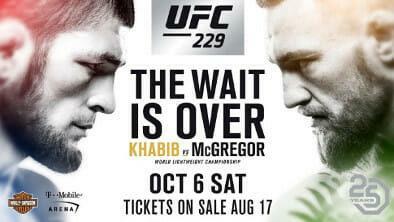 So, the UFC 229 match between McGregor and Khabib is happening on October 6th 2018 at the T-Arena, Las Vegas, USA, but if you live nearby and are thinking of purchasing tickets for this massive event you can forget it. Tickets disappeared almost instantly after going up for sale. So, if you can’t see it live in Las Vegas, what will you do? Your best bet is to grab a fight pass so that you can watch the McGregor vs Khabib live stream from the comforts of your own home. Viewing sporting events online is one of the biggest trends at the moment, because it allows sports fans the opportunity to tune in to their favorite matches and not miss out on any sporting events. Did you know that even the UFC is geo-restricted? Because of this, when you order a fight pass, it will only be available through an international VPN. This is when your VPN service gets handy, because it allows you to switch regions as well as paying a lower price for your fight pass sometimes saving you up to half the price. It all comes down to your individual needs when you’re looking at selecting a VPN. No one VPN provider is perfect, but there has to be one out there that will get the job done to suit your requirements. In saying that, we have prepared a quick list of some of the best VPN services around. Based in the British Virgin Islands, there is a reason that ExpressVPN has made the top of our list. Simply put, they have repeatedly proven to be the best VPN service available at the moment. It has a strong encryption which allows you maximum privacy. Although some of your private information may be recorded with the company like your name and your email address as well as your payment information you can be sure that ExpressVPN will not share this with anyone else. Keeping zero logs is one of their greatest features. This was proven recently when Turkish authorities demanded specific logging information, but ExpressVPN kept their records sealed denying having them at all. If it is speed you’re after and watching the McGregor vs Khabib stream you are, then CyberGhost is the one for you. Streaming comes at a cost when it comes to VPNs, as often you are left with slower speeds, but not with CyberGhost. They have some of the fastest speeds available. With over 2800 servers around the globe, many of which are situated in Europe and the US, you can see why this is one of the best picks around. Another extremely popular VPN provider is NordVPN. These guys pride themselves on providing their customers with the best security around, so if that is what you are after, it might be an idea to consider their services. They have a huge amount of servers in over 60 countries as well as having a cool feature called CyberSec. This feature will make sure that you have no trouble regarding ads, malware or bots. They also have a maximum loss of speed of 5%, which is pretty much unnoticable. Can I Watch the Mcgregor vs Khabib Fight Live Online Free? It is no surprise that this is one of the most common questions that has come up with people wanting to tune in on October 6th. Watching it for free is not an option at the moment, as there are no free streams at present. Although there are some online sites claiming to provide this service for free, many of them are quite misleading and might even be very dangerous for your online privacy. Look at it this way, your privacy and online security is just not worth compromising for one UFC fight. Your best bet by far is to invest in a VPN and have a secure and reliable connection on the day for carefree streaming. If you are looking forward to this historic match, you’re not the only one. But we were really interested in what the professionals had to say about the matter. On the other hand you also have Owen Roddy, who is McGregor’s striking coach. He went on to say that the absence from the UFC Octagon is not something that worries the professional athlete. “Other people are affected by that. Even myself, I would have been very nervous if I hadn’t fought. Conor’s different. When he goes in there, it doesn’t matter if he fought last week or two years ago, he gets in there and he’s just always on point, always focused. “The work will be ending outside the Octagon and Conor will still just focus on what he’s doing in the cage. The fight between Khabib and McGregor is sure to be one of the best we’ve seen this year, and it is no surprise that so many people want to find the best way to watch the match. The UFC is building up tension by having the biggest and best UFC superstars fight one another. But let’s face it, if you’re not watching live, you may as well not tune in at all. So, your best solution is to get signed up with a VPN and watch the biggest UFC match of the season. Your only regret will be missing it.